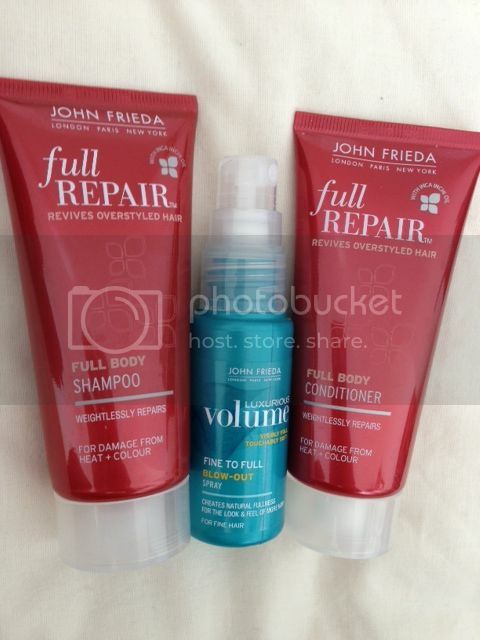 John Frieda Full Repair Range Review..
Hello! Have you all been entering the giveaways? There's been some corkers this week already, if I do say so myself! So, as you may know, I sometimes briefly dabble in a bit of beauty blogging, but I'm not an expert and can only tell you what I think from my point of view. A couple of weeks ago I was sent some testers from the John Frieda Full Repair range, that promise to "replenish your hair with Full Repair"
A bold statement no? Especially to someone like me who, after years of dying, ill-advised perms and a strong addiction to straighteners for most of the 2000's does not have the greatest of hair. But I thought it would be fun to try them out. I was sent the shampoo, conditioner and blow dry spray. I'm not a huge conditioner user as my hair is so thin it tends to make it greasy and lank, so I only condition once a month tops. But I used the shampoo every other day and the the same for the blow dry spray for 2 weeks. I can honestly say I saw a marked improvement in both my hairs condition and volume. As mentioned with thin hair it can be hard to get volume into my hair and often rely on dry shampoo to give it some oomph, but the blow dry spray was really great! I was really pleased with the products and think I'll have to slip some full sized products into my shopping trolley next time I'm at the supermarket!